Maritzburg get their Absa Premiership campaign up and running when they take on newly promoted Jomo Cosmos at Harry Gwala on Monday evening, 17H00. United will be looking to build on last season’s success, when they earned 40 points to claim a first ever top eight finish. Cosmos meanwhile finished in second place on the National First Division log last season and then went on to win the play-offs with Black Leopards and Moroka Swallows. Cosmos were in the First Division for the past three seasons. The Team of Choice have met with Ezenkosi on eight previous occasions, since 2005/06. United have won twice, Cosmos three times, and there have been three draws. The PMB side have won two of their four home matches against Cosmos, losing one and drawing one. 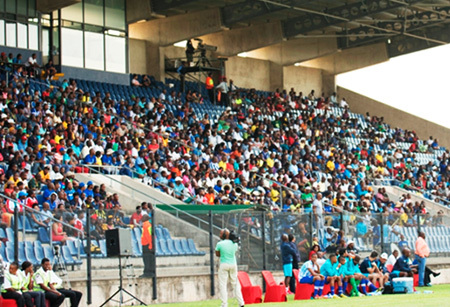 When two sides met in the 2011/12 season, the last time Cosmos were in the top flight, Maritzburg won 3-1 at home and then drew 1-1 in the return match. Maritzburg line-up from their 5-3 MTN8 loss to Kaizer Chiefs: Vries, Teyise, De Jongh, Booysen, Mekoa (Moholo 119’), Zulu, Lentjies, Mkhize, Hartog, Cele (Makaringe 52’), Anas (Mokate 69’). Maritzburg United took Kaizer Chiefs to extra time before going down 5-3 at the FNB Stadium in what was their first ever MTN8 outing.